Attending one of the BSA’s national high-adventure bases — Northern Tier, Philmont, Sea Base or the Summit Bechtel Reserve — will change your life. Attending three or four? Why, an accomplishment like that deserves an award. Scouts, Venturers and adult leaders who participate in a qualifying high-adventure program at three of the BSA’s national high-adventure bases may receive the Triple Crown of National High Adventure award. Those who participate in a qualifying high-adventure program at all four may receive the new Grand Slam of National High Adventure award. The awards are administered by the Charles L. Sommers Alumni Association, and applications are now accepted online at the association’s slick new website. Here’s everything you should know about these awards — including, of course, a look at the patches. What is it? Created in 1996, the Triple Crown of National High Adventure award recognizes those who have participated in at least one qualifying high-adventure program at any three of the BSA’s four national high-adventure Bases. That’s Northern Tier High Adventure Bases (Northern Tier), Philmont Scout Ranch (Philmont), Florida National High Adventure Sea Base (Florida Sea Base), and Paul R. Christen National High Adventure Base at The Summit (Paul R. Christen). The 10,000th Triple Crown was awarded this summer. Which programs count? To put it broadly, you can count the programs for which these high-adventure bases are known. That means Philmont treks, weeks at the Paul R. Christen base, Sea Base adventures and Northern Tier voyages. Activities that don’t count include training conferences, the national jamboree and family programs. The complete list of qualifying programs is available on the official site. What do you get? Recipients of the award receive a 3-inch Triple Crown award patch reflecting the three national high-adventure bases where they participated in a high-adventure program. An optional large (6-inch) Triple Crown of National High Adventure award patch is available for purchase. There is no limit on the variations and quantities that may be ordered of the large patch. The patch will show a combination of animals that represents the three bases attended: a loon for Northern Tier, a bull for Philmont, a dolphin for Florida Sea Base and a black bear for Paul R. Christen. How do you apply? Online only. You do so at this site. Note: The paper application used for the original Triple Crown (Northern Tier, Philmont and Florida Sea Base) has been discontinued and will no longer be accepted if received after Oct. 31, 2015. Those who have already submitted a paper application should not resubmit online, as doing so will result in further delays in processing their awards. The association says it currently takes about eight weeks to process paper applications from mid-summer to fall because of the large numbers of award applications received during this time. Applying costs $9, which covers the cost of the patch. You can buy 6-inch versions of the patches separately for $10 apiece. How do you keep track of participation? To help, use the printable fact sheet and worksheet, available on the “About the Awards” page here. What if I have other questions? There’s a helpful FAQs here. What is it? 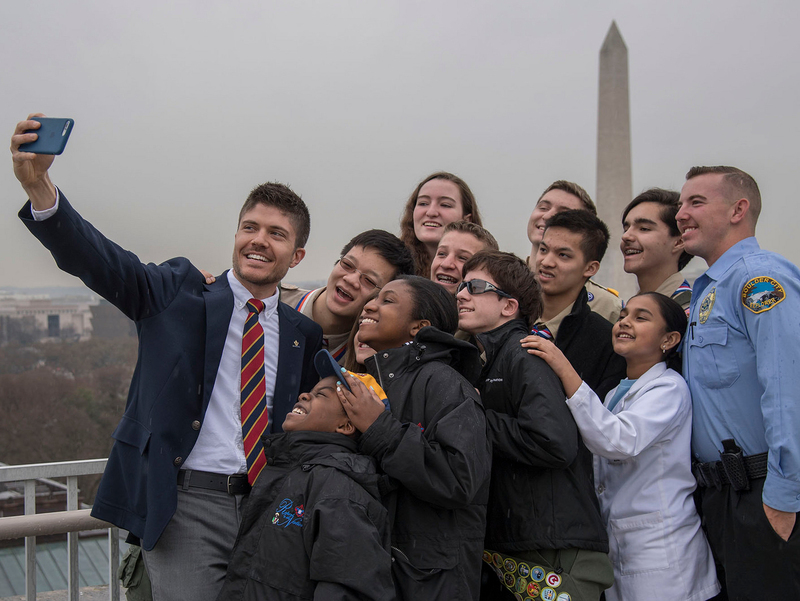 The new Grand Slam of National High Adventure award recognizes those who have participated in at least one qualifying high-adventure program at all four of the BSA’s national high-adventure bases. Which programs count? Same list included with the Triple Crown. See which programs qualify on the official site. What do you get? Recipients of the award receive one 3-inch Grand Slam patch. An optional large (6-inch) version is available for purchase. How do you apply? Same as with the Triple Crown, you can only apply online. Do so at this site. How do you keep track of participation? Use the printable fact sheet and worksheet, available on the “About the Awards” page here.